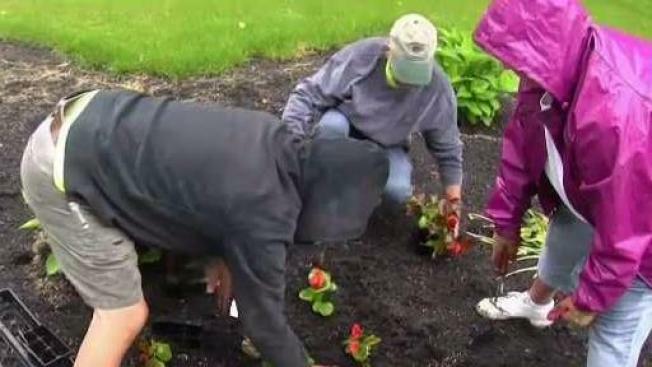 Volunteers in Maine spent a rainy day gardening, replacing flowers stolen last weekend from First Parish Cemetery. With each scarlet begonia, the community in York, Maine, is righting a wrong, replacing flowers stolen from the First Parish Cemetery. A team of volunteers planted more than 200 flowers at the cemetery Monday morning, eager to get in the garden despite the rainy weather. "It means so much to the people who lost flowers," said Carol Frederick. Sometime last week, someone stole at least eight flower arrangements and potted plants in the cemetery. Superintendent Todd Frederick said he came into work last Monday and had several messages on his answering machine from families asking if cemetery staff moved their flowers. As the complaints rolled in, Frederick realized there had been theft. He said it was heartbreaking to have parents who just buried their son about a month ago find flowers missing from his grave. "These people are still grieving — deep grief," he said. "It's really sad that someone would desecrate a cemetery like that." As York Police investigate, word is spreading around the community about the crime. "There are just lines you don't cross," said Gary Grossman, the owner of the Long Beach Motor Inn. He said he knows several people buried at the First Parish Cemetery, and knew he had a way to help those impacted by the theft. Every year, he plants thousands of flowers around his business property. This year, he figured he could part with some. "It was a no-brainer," Grossman said. He donated more than 200 scarlet begonias to the cemetery. As the cemetery superintendent watched volunteers plant the donated flowers Monday morning, he said he got goosebumps. "There are loving and caring people in the community," he said.